Culver City residents and area businesses are asking these questions about construction. Get the answers here. 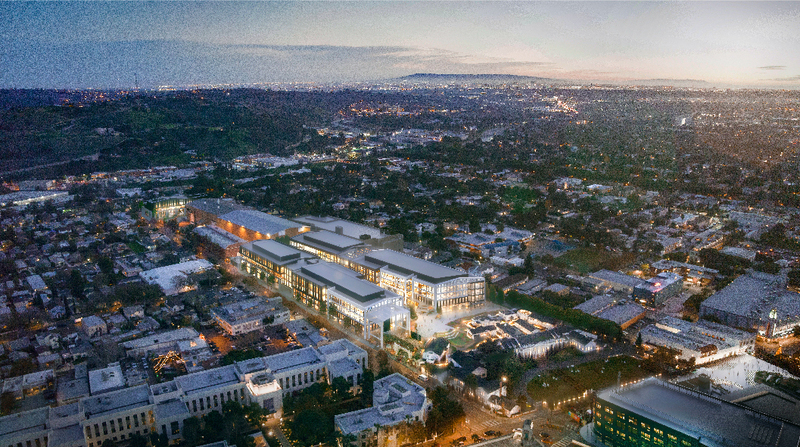 The Innovation Plan is the blueprint for the modernization of The Culver Studios. The transformation will more than double the size of the lot, from 358,203 to 720,850 square feet and will put the campus on the vanguard of next-generation entertainment productions. Creative offices, stages and production support spaces will all be state of the art and offer cutting-edge technology for both traditional and digital media needs. The Culver Studios is 100 years old. The site’s infrastructure and many of its buildings haven’t been upgraded for 40 years. In order to remain competitive in the changing media landscape, The Culver Studios must modernize. The Innovation Plan will secure the studio’s long-range future in the industry. 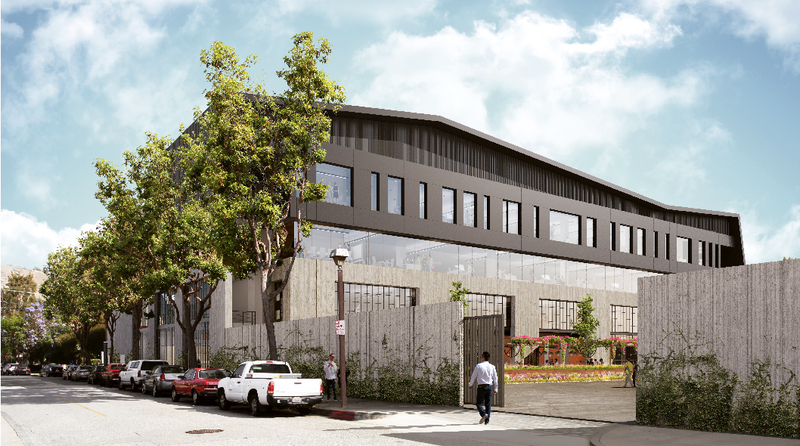 It will also fuel Culver City’s creative-based economy, bringing jobs to the community. Quite the contrary. The first phase of the Innovation Plan, completed in April 2018, was carefully undertaken to preserve the site’s historic structures. The Mansion was retrofitted and the original landscaping was replicated. In addition, Bungalows were restored and were relocated. Now, all six Bungalows are grouped together behind the Mansion, toward the front of the lot, creating a prominent node that celebrates our legacy. Amazon Studios currently occupies these landmark buildings. 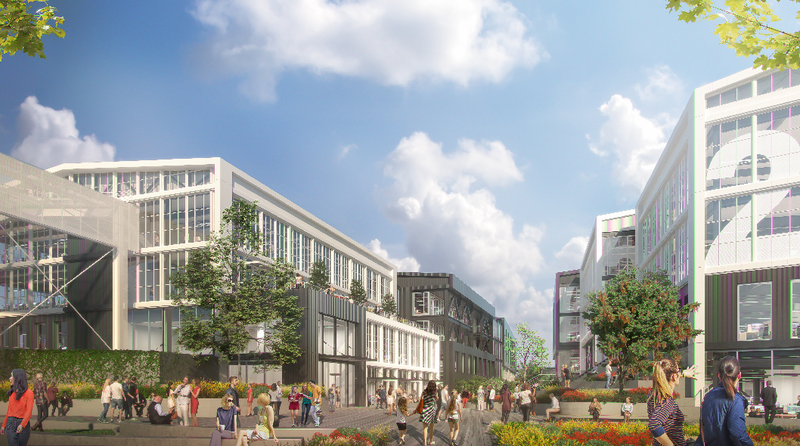 Amazon Studios and its related-content affiliates will occupy nearly 530,000 square feet of the 720,850-square-foot campus when it’s completed. This includes the the Mansion and Bungalow space that Amazon Studios currently occupies. The next phase of construction began in August, 2018, when we erected a 20-foot sound wall between the studio and our residential neighbors. Demolition began in September, starting with the outdated parking facility on the far western portion of the lot, along Van Buren Place. Removal of the parking structure will make way for the new Van Buren parking garage, approved in 2016. Subsequently, four stages will be demolished to create room for a second parking garage, a centrally located, subterranean facility. 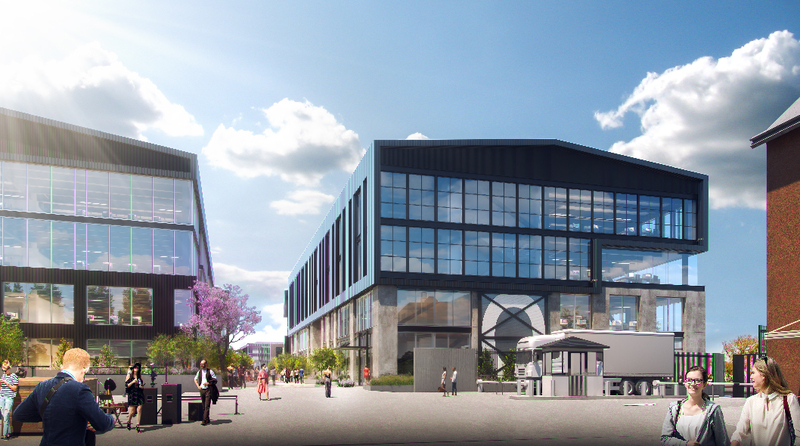 Five new creative office /digital media buildings also will be built. Parking facilities are slated for completion in the spring of 2020. 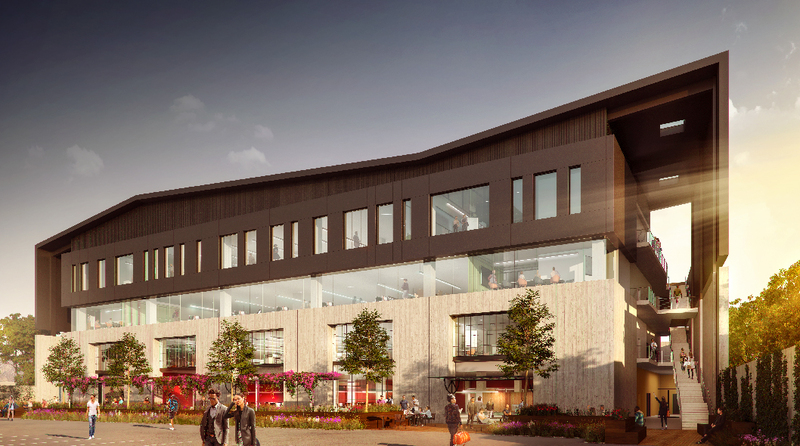 Two of the five new creative office buildings are slated for completion in the fall of 2020, with the remainder of the work, including the last three office buildings, to be completed in the spring of 2021. For the most part, work will occur between the hours of 8 am and 6 pm, Monday through Friday. No regular weekend work is anticipated. However, from time to time, it may be necessary to work on Saturdays and/or Sundays. Should weekend work take place, it will be scheduled within the limited hours permitted by the City of Culver City. 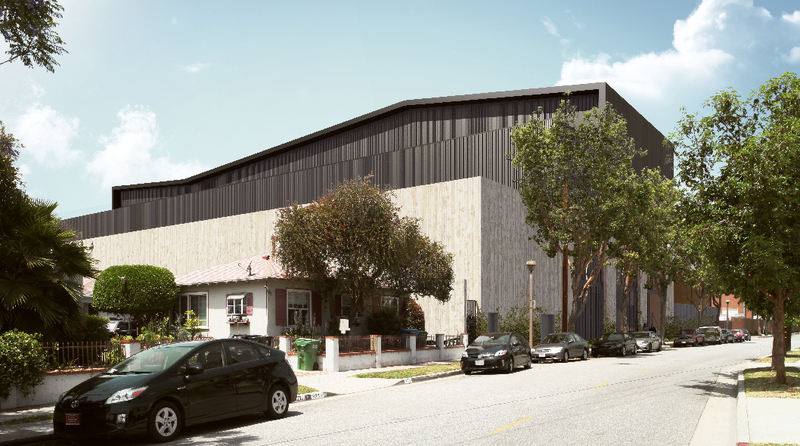 The Culver Studios will operate on a limited basis during construction. The Mansion and Bungalows will continue to be fully occupied by Amazon Studios, as was announced in November 2017. There are eight existing stages that will remain on the southern portion of the lot. These will be used by current tenants through August 2019. All construction is dusty, although you’ll notice a significant decrease in dust after the first six months of construction. Please know, too, that we are employing best practices to minimize dust by voluntarily implementing the Air Quality Management District guidelines. These include keeping dirt and debris moist, hosing down the construction site continuously, tightly covering all trucks hauling away dirt and debris with tarp, and not permitting construction trucks to idle on site for longer than five minutes. All hauling trucks will access the site from Ince Blvd. from the north. No trucks will go south of Gate 3 (Hubbard St.), nor will they pass through the downtown residential neighborhood. The preferred hauling route, approved by the City, has trucks exiting the Studio via Ince to eastbound Washington, to either northbound National or Robertson, in order to access the 10 freeway. We fully understand the community’s sensitivity to noise and are embracing industry best practices to minimize it. For example, we erected a 20-foot sound wall between the studio and surrounding neighborhood. The wall has specially-rated insulation that absorbs sound and reduces noise by 20dBs. We also are limiting construction hours, in general, to 8 am to 6 pm during the week, while most people are at work. The Culver Studios has forged strong relationships with Linwood E. Howe elementary school and the Culver City Unified School District. We have been coordinating timelines with them from the beginning of the development process, and will continue to stay in close communication throughout construction.We’ve also taken specific action to minimize dust and noise—replacing classroom windows with double-pane glass and adding insulation. Yes. The Culver Studios worked with our neighbors during the entitlement process to make sure the trees will not be compromised. In preparation for the installation of the soundwall along the fenceline, we trimmed some of the trees on both sides of the fence. Trimming was done under the supervision of a licensed arborist, at no cost to our neighbors. If, as a result of our construction activities, any of the trees do not survive, we will replace them at the end of the project, at no cost to the property owner. If replacement is necessary, property owners will be invited to help select the trees and landscaping. In addition, at the end of the development, The Culver Studio will need to rebuild its perimeter fence. If, as a result, relandscaping is required along those portions where we share a wall with our Van Buren neighbors, we will do so and incur the costs. We take neighborhood quality of life very seriously and understand that the community should not shoulder construction parking. For these reasons, workers will be provided with on-site parking and, if necessary, parking in off-site garages and lots, from where they’d be shuttled-in. Workers will be clearly informed that they are not permitted to park in the residential area and on residential streets.If workers do not comply with parking instructions, they may be removed from the job. All construction staging will occur on the studio lot. However,at the end of the project, when a new perimeter wall will be erected on the property line, construction work may encroach on adjacent properties. At any time, if access to private property is required, we will notify the property owner in advance, and get permission. No lane closures are anticipated, although limited sidewalk closures may be necessary along the west side of Ince during construction. Appropriate signage and a safe pedestrian route will be provided. Additionally, for any such closure, we will seek appropriate permits from the City and will provide adequate notification to our neighbors and the public. No. All construction traffic must enter and exit The Culver Studios from the north via Ince Blvd. No studio traffic will be permitted along Ince south of Gate 3 (Hubbard St.), and no access is provided from Van Buren. 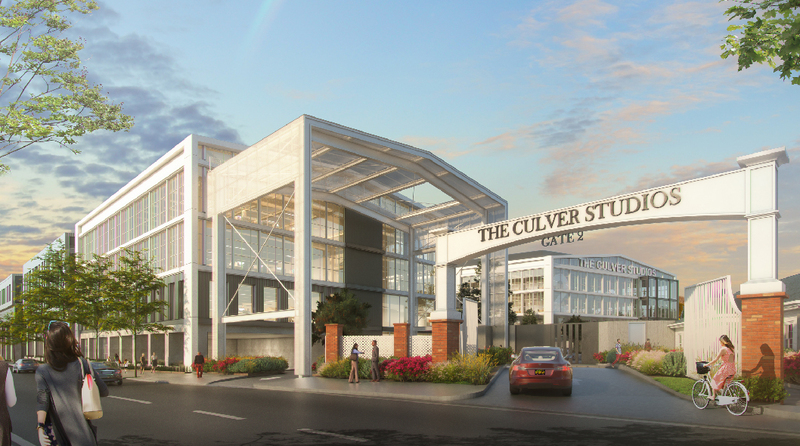 The Culver Studios will continue to have a secure perimeter during construction. Access will continue to be controlled for vehicles and pedestrians, and 24-hour security will be maintained on the lot at all times. If there is a security concern, please contact (310) 202-3254during regular business hours or 310-202-3254 after hours. We have set up several different ways to get in touch with the construction team during construction. You may call our dedicated construction hotline at (310) 202-5585. Or you may email us at construction@theculverstudios.com. Both are being monitored regularly, and we will address your questions or concerns promptly.